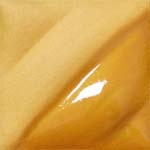 Description AMACO® Velvets semi-translucent underglazes have the appearance of velour or velvet when left unglazed or will intensify in color when covered with an AMACO® Clear Transparent or Gloss glaze. Other Information Designer Velvets may be brushed on greenware which is to be bisque fired before applying a covering glaze, or on a mature Cone 04 (1971°F, 1077°C) bisque, then a covering glaze applied. For opaque coverage by brushing, the consistency of the color in the jar is correct.